Did you know that every two days as much data is created as was created since the dawn of civilization until 2003? With that much data out there, it’s no surprise that sync has become an integral part of our everyday lives. Whether it’s keeping your emails synced across devices, sending a file via Dropbox, or keeping up with your business by syncing your contacts, calendars, tasks, and more with CompanionLink, sync is nearly everywhere. Take a look at the infographic below to see just how prevalent sync is in our everyday lives! Then, let us know what you sync in the comments below. 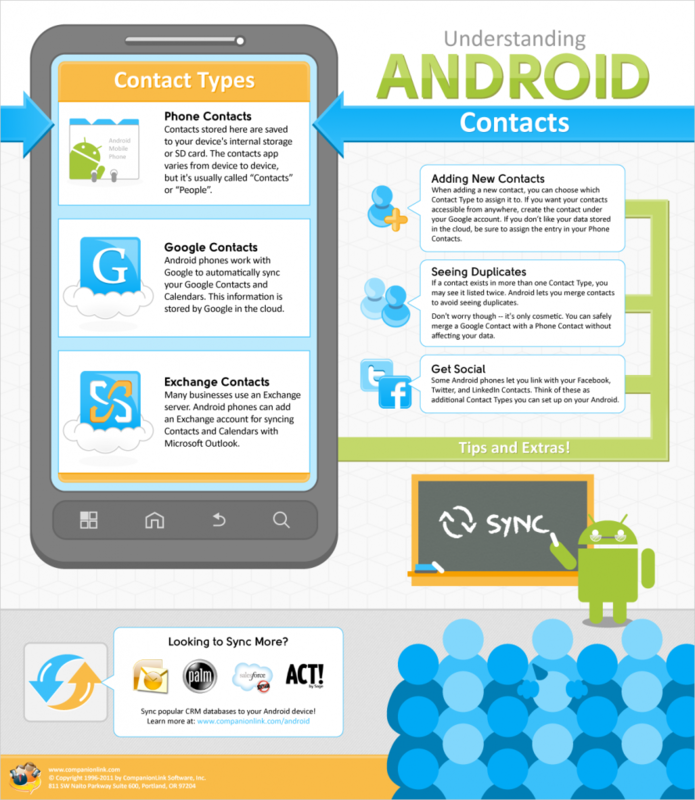 Confused about how Android Contacts and Accounts work? We’ve created an infographic that helps explain the chaos! Update: Now that Motorola’s DROID RAZR and Samsung’s Galaxy Nexus (featuring the next generation of Android – Ice Cream Sandwich) have been announced, this infographic is even more relevant. These two phones are sure to draw many users over to Android for the first time! Coming to Android from a “feature phone,” a BlackBerry, or even iOS, there are a number of new features to get used to. One aspect that we’ve seen a lot of uncertainty about is exactly how Contacts work on Android. From the pager to the iPad, mobile devices have been enhancing our mobile productivity in one way or another for decades. In their early days, mobile devices were largely business-focused. Since then, they have become sleeker, more powerful, and even more appealing to consumers and business users alike. On today’s mobile devices, you can run your business or play Angry Birds – or both! Read through the infographic below and take a walk through a history of mobile productivity. Discover the first portable handset. Learn how the groundwork for today’s app stores was laid in the 1990s. Reminisce over the earliest smartphones and tablets. Then, share with us where you think mobile productivity is headed next!